In the 14 December 2018 issue of Al Hakam, Abdul Hadi (Italo) Chiussi was mentioned who was formerly an Italian Esperantist and later translated the Quran into the Esperanto language. Below is a short introduction to this individual who was an Ahmadi Muslim. Mr Italo Chiussi was born in Trieste, Italy. In a staunch Catholic family, he received his basic education at a senior high school in the multiethnic city of Harburg and acquired his doctorate in mathematical sciences with distinction from the University of Pisa. After his successful teaching career in Trieste, he served in Germany as managing director of Italy’s famous insurance company Generali till his death. Once, Mr Italo was experiencing some health issues whilst on vacation. One day, during a leisurely walk with his son in front of Nur Mosque of Frankfurt, he casually paid a brief visit of the building. Later, this brief introduction developed into a deep connection, and he began learning the Arabic language and reading the Holy Quran. Thus, gaps between his visits became shorter, but he would politely dismiss all notions that he was going to be a member of the Jamaat. 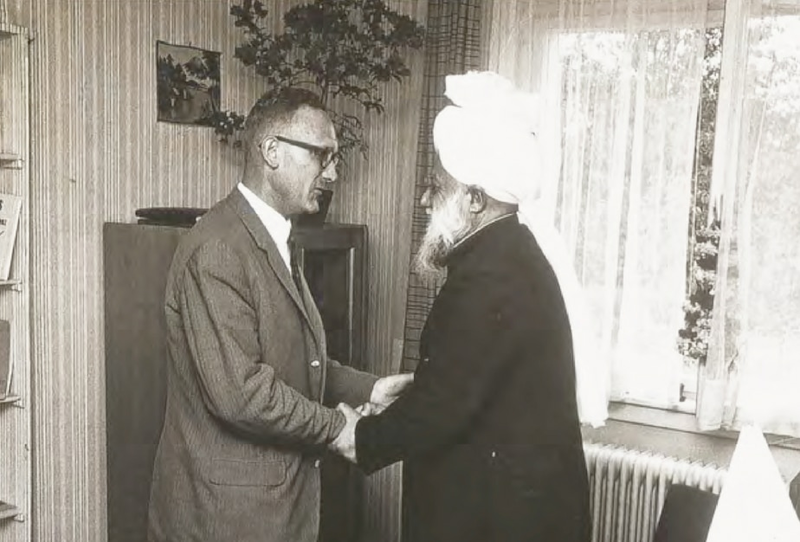 In 1967, when Hazrat Khalifatul Masih IIIrh visited Europe, Mr Italo had the blessed opportunity to meet him. This was a turning point in his life. He became a sincere and devoted member of the Jamaat and had already started praying five times daily and fasting in the holy month of Ramadan, all done secretly from his family. He visited Mecca and Medina, went to Qadian and travelled to Jalsa Salana Rabwah in 1970. His travelogue, containing his spiritual experiences during his visit to the holy city of Mecca was much loved by Hazrat Mirza Tahir Ahmadrh. Generali issued a detailed eulogy after his death and expressed its condolences to his family, his brothers in the Ahmadiyya Muslim Jamaat all over the world and his worldwide Esperanto friends. Hazrat Mirza Nasir Ahmad, Khalifatul Masih IIIrh went to his grave and prayed there during his 1976 tour. He knew French, English, German and classical Arabic, and remained a humble student of Islam till his last breath. Mr Chiussi wanted to serve the word of God, thus he chose to translate it into the Esperanto language. It is the most widely spoken constructed international auxiliary language, created by LL Zamenhof, a Polish-Jewish ophthalmologist, in the late nineteenth century. His goal was to create an easy and flexible language that would serve as a universal second language to foster peace and international understanding. His original title for the language was simply the international language. Mr Chiussi wanted to pay attention to each and every word of the holy book by translating it. He took leave from his office and went in solace, spending many weeks working on the translation in a hotel room, in a small town, fifty miles away from Frankfurt. He dispatched copies of the translation to many dignitaries around the world. Mr Italo Chiussi had very rarely attended conferences. He once delivered a lecture during the 54th Universal Congress in Helsinki, 1969, on Esperanto and Islam. The following year he delivered a speech in Rabwah in the presence of Hazrat Khalifatul Masih IIIrh.